and a sequencing batch biofilm reactor were studied, using zinc and copper ... reactor and Cu removal of 50-70 % by using sequencing batch biofilm reactor. Wastes. Monisha Jaishankar, Blessy Baby Mathew*, Moshami Sailesh Shah, Krishna Murthy T.P., Sangeetha Gowda K.R. ... soil, food, certain consumer products, lead smelters, metal ... using domestic mixer (Sujata mixer grinder- Dynamix. 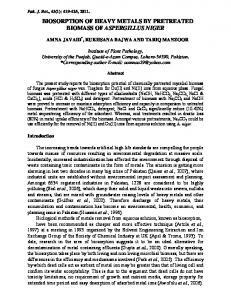 ABSTRACT: This paper aims to study the biosorption for removal of lead, cadmium, copper and arsenic ions using algae as a biosorbent. A series of experiments were carried out to obtain the breakthrough data in a fluidized bed reactor. The minimum fluidization velocities of beds were found to be 2.27 and 3.64 mm/s for mish sizes of 0.4-0.6 and 0.6-1 mm diameters, respectively. An ideal plug flow model has been adopted to characterize the fluidized bed reactor. This model has been solved numerically using MATLAB version 6.5. The results showed a well fitting with the experimental data. Different operating conditions were varied: static bed height, superficial velocity and particle diameter. The breakthrough curves were plotted for each metal. Pb2+ showed the largest breakthrough time compared with others, while Cd2+ had the lowest value. Keywords: Algae; Heavy metals; Fluidized bed; Breakthrough curve. the pH solution increased to 5.0. On further increase in pH to 6.0 and 7.0 the biosorption capacity remained almost stable at 16.89 and 17.02 mg/g, respectively. Wang et al., (2011) studied the removal of emulsified oil from water by inverse fluidization of hydrophobic silica aerogels (Nanogel). The hydrodynamics characteristics of the Nanogel granules of different size ranges are studied by measuring the pressure drop and bed expansion as a function of superficial water velocity. The minimum fluidization velocity was measured experimentally by plotting the pressure drop against the superficial fluid velocity. The results showed that the major factors which affect the oil removal efficiency and capacity are the size of Nanogel granules, bed height, and fluid superficial velocity.. Also the experimental data showed that the Nanogel particles can absorb as much as 2.8 times their weight of oil by the inverse fluidization process. 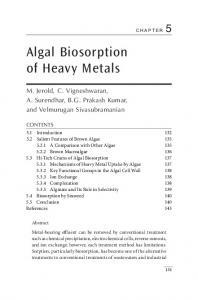 From the previous literature related to the biosorption of heavy metal using algae, it can be concluded the following points: • In recent years, there have been a significant increase in the studies concerning algae as biosorbents for removal of heavy metal due to their binding ability, availability and low cost. • It was found that there is lack in literature of using algal biomass as a biosorbent in Iraq • Several studies concluded that the biosorption mechanisms involving algae are an ion exchange reaction type between light metals already bound to the algae and other metals present in the aqueous solution. Also, the optimum pH for removal was around 3 to 5. This work aims to study some parameters that influenced the behavior of liquid fluidized bed for removal of Pb2+, Cd2+, Cu2+ and As3+ from wastewater using algal biomass. In the fluidized bed, the aqueous solution with influent concentration flows from the bottom to the top. The variation of the pollutant concentration in the liquid phase with time at different bed lengths can be measured. In the present work, a fluidized bed reactor was adopted for the continuous removal of metal. Fig.1 shows a model of fluidized bed reactor. Breakthrough curves serve two purposes (a) to decide whether the adsorbate is efficient for the required separation and (b) to establish break point (process interpretation), based on some criterion, either technical, economic or legal (Knaebel, 1999). experiments in system. he biomass particle size distribution was determined using a set of standard sieves. Since the algal biomass could swell in water, therefore the biomass was initially soaked in water and then wet sieved. Particles density, surface area and voidage were measured and listed in Table 2. The initial and boundary conditions are: 0As>Cu>Cd. Pb2+ demonstrated higher biosorption compared with others, this can be attributed to high electronagativty of this metal ion. The effect of varying the bed height of algal biomass on the biosorption process was investigated in Fig. 8 for U=1.1Umf, Co=50 ppm, dp=0.4-0.6 mm and bed weight 50, 100 and 150 g (corresponding to static bed heights 2.5, 5 and 7.5 cm). It can be seen in these Figures with increasing the weight of particles biomass the time at which an effluent concentration reached equilibrium increased, this is due to large contact time occurred between metal solution and particles at high bed height, smaller bed heights will be saturated in less time. Also, an increase in the bed depth will increase the surface area or adsorption site which improves the adsorption process. each metal, Pb2+ showed the largest breakthrough time compared with others, while the Cd2+ had the lowest value. This can be attributed to the largest electronegativity value compared with others. mathematical model. Chem. Tech. and Biotech., 74, 71-77. Crist, R.H., Martin, J.R., Carr, D., Waston, J.R., Clarke, H.J., Crist, D.R., 1994. Interaction of metals and protons with algae. Environ. Sci. Technol. 28, 1859-1866. In fluidized bed system, an increase in the bed depth of algal biomass will increase the breakthrough time. An increase in the bed depth will increase surface area of adsorption. Increasing the solution flow rate decreased the breakthrough time due to the decrease in the contact time between the adsorbate and the adsorbent, as well as, at low flow rate the metal ions will have a sufficient contact time to occupy the spaces within the particles. Also, it was found that an increase in particle size caused a decrease of the breakpoint time due to surface area of large particles is lower than small particles. Cui, H., Grace, J.R., 2007. Fluidization of biomass particles: A review of experimental multiphase flow aspects, Chemical. Eng. Sci 62,45-55. Davis, A., Volesky, B., Mucci, A., 2003. 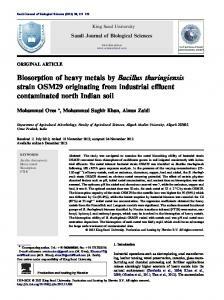 A review of the biochemisty of heavy metals biosorption by brown algae. Water Research 37, 4311-4330. Diniz, V., Weber, M.E., Volesky, B., Naja, G., 2008. 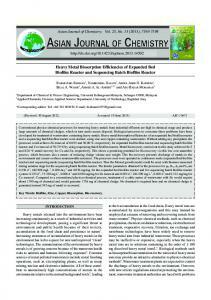 Column biosorption of lanthanum and europium by sargassum. Water Research 47, 363371. ACKNOWLEDGMENT We would like to express our sincere thanks and deep gratitude to the Ministry of Water Resources/ Center for the Restoration of Iraqi Marshlands and Wetlands for supporting this work financially. Figueria, M.M., Volesky, B., Ciminelli, V.S.T., Roddlick, F.A., 2000. Biosorption of metals in brown seaweed biomass. Water Research 34, 196204. Fu, Y., Liu, D., 2007. Novel experimental phenomena of fine-particle fluidized bed. Experimental Thermal and Fluid Science 32, 341344. REFERENCES Al-Hassany, J.S., 2003, "A Study of the Ecology and Diversity of Epiphytic Algae on Some Aquatic Plants in Al-Hawizah Marshes, Southern Iraq", M.Sc. Dissertation, College of Science for Women, University of Baghdad. Gin, K.Y., Tang, Y., Aziz, M.A., 2002. 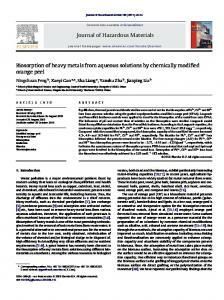 Derivation and Application of a new Model for Heavy Metal Biosorption by Algae. Water Research 36, 13131323. APHA (American Public Health Association), 2005. Standard Method for the Examination of Water and Wastwater. 21st. ed. American Public Health Association. Hamm, L.L., Hang, T., McCab, D.J., King, W.D., "Preliminary ion exchange modelling for removal of cesium from Hanford waste using hydrous crystalline silicotitanate material", Westinghouse Savannah River Company: WSRC-TR-200100400. 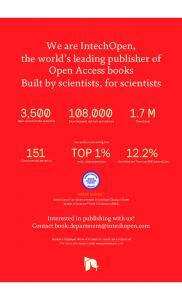 pdf internet source, 2002, 17 May 2012, . Kassim, T., "The phytoplankton in Iraqi aquatic habitats", pdf internet source, 2007, 15 May 2012. .
Romera, E., Gonzalez, F., Ballester, A., Blazquez, M.J., 2006. Biosorption with algae: statistical review. Crit. Rev. Biotechnol. 26, 223-235. Knaebel, K., 1999. The basic of adsorber design. Chemical Engineering. 92-101. Kratochvil, D., 1997. A study of the Metal Biosorption Process Utilizing Sargassum Seaweed Biomass, Ph.D Thesis, McGill University, Department of Chemical Engineering. 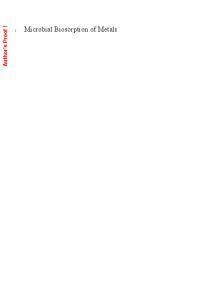 Romera, E., Gonzalez, F., Ballester, A., Blazquez, M.J., 2007. 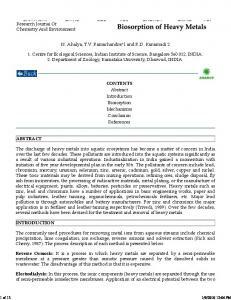 Comparative study of heavy metals using different types of algae. Bioresource Tech. 98, 3344-3353. Melcakova, I., Ruzovic, T., 2010, "Biosorption of Zink from Aqueous Solution Using Algae and Plant Biomass", Nova Biotechnologica, 10(1), 3343. Sulaymon, A.H., Ebrahim, S.E., Abdullah, S.M., Al-Musawi, T., 2010. 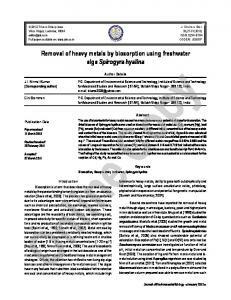 Removal of Lead, Cadmium, and Mercury Ions Using Biosorption. Desalination and Water Treatment 24,344-352. Naja, G., Volesky, B., 2006. Behavior of mass transfer zone in a biosorption column. Environ. Sci. Technol. 40(12), 3996-4003. 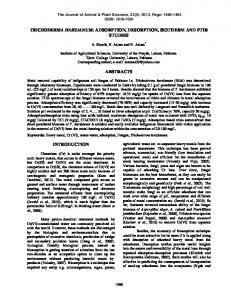 Sunduqgee, R.H., "Marine algae", Asharq AlAwsat newspaper. No: 9977, 23 March 2006. .
Ngian, K.F., Martin, W.R., 1980. Bed expansion characteristics of liquid fluidized particles with attached microbial growth, Biotechnol. and Bioeng. 22, 1843-1856. 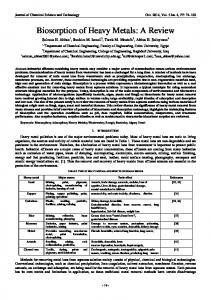 Wang, J., Chen, C., 2009, "Biosorbents for heavy metals removal and their future", Biotechnol. Advances, 27, 195-226. Park, Y.G., Cho, S.Y., Kim, S.J., Lee, G.B., 1999 Kim B.H., Park S.J., Mass transfer in semifluidized and fluidized ion-exchange beds. Envi. Eng. Res 4(2), 71-80. Wang, D., McLaughlin, E., Pfeffer, R., Lin, Y.S., 2011. Aqueous phase adsorption of toluene in a packed and fluidized bed of hydropholic aerogels. Chemical Engineering168, 1201-1208. Rathinam, A., Maharshi, B, Janardhanan, S.K, Jonnalagadda, R.R, Nair, B.U., 2010, “Biosorption of cadmium metal ion from simulated wastewaters using Hypnea valentiae biomass: A kinetic and thermodynamic study", Biores. Technol., 101, 1466–1470. Wikipedia, "The Free Encyclopedia", Internet Resource, 4 June 2012 . Williams, C.J., Aderhol, D., Edyvean, R.G.J., 1998. Comparison between biosorbents for the removal of metal ions from aqueous solutions. Water Research 32, 216-224. Richardson, J.F., Harker, J.H., Bachurst, J.R., 2002," Coulson and Richardson’s CHEMICAL ENGINEERING, Particle Technology and Separation Processes", Vol. (2), 5th Edition, Butterworth-Heinemann. Ridha, M.J., 2011, "Competitive Biosorption of Heavy Metals Using Expanded Granular Sludge Bed Reactor", Ph.D. Thesis, University of Baghdad, College of Engineering. Table 3. The atomic properties of Pb2+, Cd2+, Cu2+ and As3+ ions (Wikipedia, 2012) Metal Atomic Radius (pm)* Electronegativity (Pauling scale)** 2+ Pb 175 2.33 2+ Cd 151 1.69 Cu2+ 128 1.9 As3+ 119 2.18 Sequence Pb>Cd>Cu>As Pb>As>Cu>Cd * pico meter =10-12 m. ** Pauling Scale: A dimensionless quantity, on a relative scale running from around 0.7 to 3.98 (Hydrogen was chosen as the reference, its electronegativity was fixed first at 2.1, later revised to 2.20). Fig.8. Experimental and theoretical breakthrough curves at different bed weight, Co=50 ppm, pH=3, 25°C, dp=0.5 mm and U=1.1Umf. 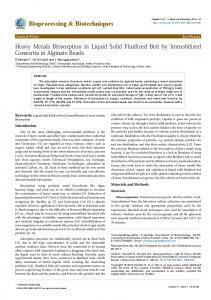 Report "Multicomponent Biosorption of Heavy Metals Using Fluidized Bed of"